“Black hole” was a living squat, five rooms in a big 4 store building. It was squatted in April and evicted in end of November . 6-7 anarchists were living in the squat together with Kostya, a migrant worker from Belarus who originally lived there on his own but then together with anarchists. More than a thousand protesters marched on Saturday afternoon [December 19th, 2009] in the industrial proletarian suburb of Peiraeus, Keratsini, against state terror and the police invasion of Resalto, the local anarchist social centre two weeks ago which resulted in the arrest of 21 people who are being accused of preparing explosives for… some empty beer bottles and a few litters of heating kerosene found in the remises. Initially the state accused the arrested for terrorism but the state interrogator subsequently dropped the charges. The invasion of the 4th of december had resulted to a sponteneous local attack against the police forces guarding the centre a few hours later and to the occupation of the Keratsini city hall which was too invaded by the police with 42 people arrested despite the opposition of the mayor, the local council and the lawyer association of the town who have subsequently published official decisions condemning the repression. 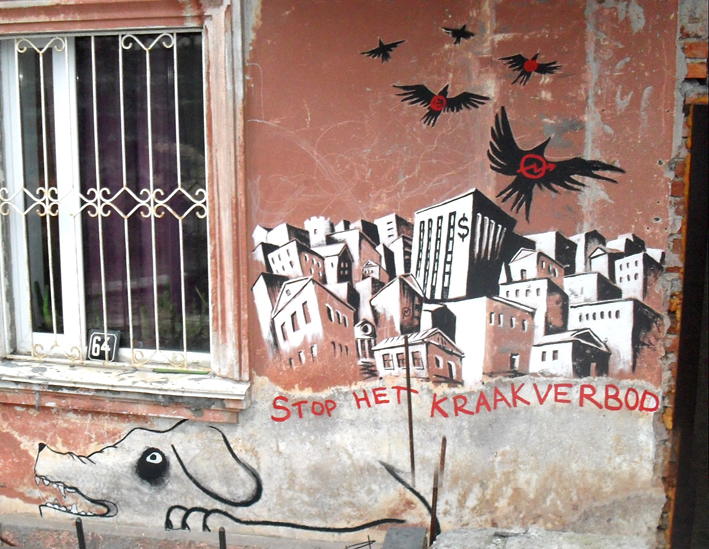 Kraakverbod the new law forbidding squatting in the Netherlands. In 2008 three political parties (CDA, ChristenUnie and VVD) began working on the new law “Kraken en Leegstand Wet”. It aims to completely criminalizing any and every form of squatting in the whole country. On the 15th of October 2009 the Dutch parliament (Tweede Kamer) voted in favour of the new law. The parties that supported this squatting ban were VVD, ChristenUnie, SGP, CDA, PVV and the independent member of the parliament Rita Verdonk. For the new law to be passed the senate (Eerste Kamer) still has to vote on it. This voting is going to take place on the 1st of December this year. After that the new law only needs the Queen’s signature to become reality. This would most likely happen before the 1st of January 2010. What exactly does this law say? In general you can split it into two parts. Evictions means riots: Update on recent events in Turin. Thursday 10 december 2009 – today’s events: The forces of repression (the same police, carabinieri, and civvies as always) evicted Ca’neira at 6:25am; at 6:45am these forces of disorder had arrived at L’ostile too. The “ostiles” got up on the roof and a rally (around 100 people) took to the streets in solidarity, and blocked Corso Vercelli, stopping the cherry-pickers from getting in, and leading to the first police charge. Out shopping, a woman from the neighbourhood went to buy cigarettes and got beaten across the back and legs for her trouble. (People from the solidarity demonstration took her to hospital). 19.00 A new Ca’neira is born and evicted again before 20:00 with excessive force, following resistance on the roof by some of the squatters and others chaining themselves to the windows; four people are taken to the police station in Via Grattoni and released around 23:00. My good friend Emil is lost since october 2009… hitchiking from Warzava to Berlin. This is an appeal/invocation to all of you who have been affected by repression and foreclosure(exclusion) or who feel solidarity for those who have, to all small groups and left communities/, artists and activists. It goes out now because the last weeks have been very tumoultously, so many things were happening, not just in Berlin, but also in many other cities and countries. It’s almost the same procedure over and over again: The minute people allow themselves room for a free space to work collectively on new ways of living and fighting together, State is fighting back with Its repression organs. Evictions, arrests and law cases turn up on the pale. No matter if it’s Erfurt, Magdeburg, Berlin, Hamburg, Dresden or Oldenburg: in the capitalist reclamation logic there is no space for free space. We have had enough of it – so now it’s time to fight back together! Struggle comes from our hearts! Here is a group of anarcho-punks, and squatters from Minsk city in Belarus. We are watching the situation in Netherlands and are excited of all this time – because for us a right for the living, autonomous spaces and creation independent culture is very important. We had a squat also like social centre in 2008 year, now we are making house-project to try to keep collective and less alienate way of living, also a space for some activities. From some political cases all places like these here are closed to wide public, but we develop inside the movement and make public events somewhere else. Also for solidarity to Netherlands squatting movement we choose to make something, which is coming directly from our hearts as we don’t have any embassy of Netherlands or another official institution – we put our feelings in picture on the wall of one’s house on 28th november 2009. We want to support you in this way, and though it is not public protests, for us it’s message to all squatters in Netherlands, for all people who resist this antikraak law over the world. We are with you! Keep on fighting!